We will be keeping records of velocity-windows, load development, & approximate barrel life from all of the barrel blank manufacturers we will carry including Bartlein 5R, Krieger 4 Groove, Rock Creek 5R, Lilja 3 Groove, & X-Caliber 6 groove barrels. We understand these results may not represent the performance of every blank, even coming in the same twist rate from the same manufacturer, but we will compile the best data we can so we can provide the best starting points for our Shooters. This graph represents two sister barrels manufactured to the same specs, at the same time, from the same MFG. We will produce additional graphs when more comparison sets of barrels get tested after break-in. We were very glad to see the 25×47 Lapua run so well! 2950 fps with no signs of pressure! That velocity combined with our 0.330 G7 Ballistic Coefficient really makes for one hell of a match rifle setup in standard length Accuracy International magazines. The 25 Creedmoor ran well and reached 3000 fps with faint ejector marks – at 3050 fps the brass began to have shiny ejector marks and we do not recommend shooting tactical matches or hunting with loads that hot. Again, every barrel and rifle is different so always do your own conservative load development – if you are inexperienced as a reloader, get in contact with a reputable gunsmith or seasoned competitive shooter. 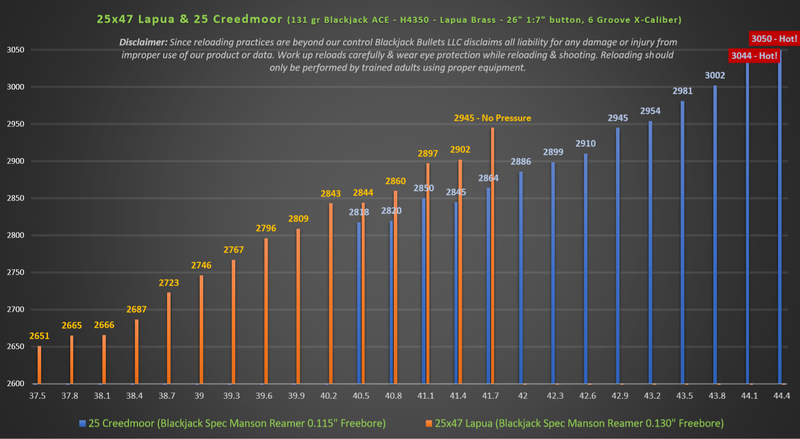 Previous post: 6.5 Creedmoor Brass comparison – Hornady data coming soon! Hey I’m currently making a logo for Jeff Johnson and he requested an engineering drawing of your 25×47 Blackjack DWG 131 ACE to be part of the backdrop for the logo. Is there any way I could get a screen shot of the DXF for that round? Basic dimensional call outs would be an added bonus. The DXF file would work too.